Introduction of entrance examination for DU undergraduate courses will not guarantee quality and on the other hand, it will encourage the aspirants to join coaching centres to crack the entrance test. Students are already loaded with burden of various examinations and DU entrance will add to the pressure. Instead of an entrance exam at the undergraduate level, the authorities should streamline the existing merit based admissions. Release of several cut-offs till August, actually causes confusion among students and faculties in their respective colleges. This will be an additional financial burden for the parents, especially from the economically weaker section. DU is one of the most prestigious universities of India and bears a ‘national character’. Students dream of studying here. But, there are many education boards with different difficulty levels. In my opinion, entrance based admission will do justice to students. Moreover, it is also desirable to conduct entrance test through offline mode, as it will benefit students from far-flung areas. Other than DU, all central universities have been following entrance examination based admission process. 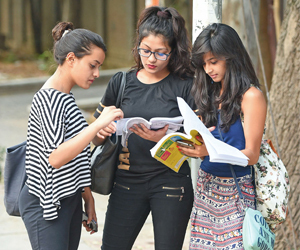 DU too has the same process for admission for its PG and certain professional courses, but DU conducts its entrance exam in Delhi only which invites trouble for both organisers and aspirants. In view of large number of applicants for undergraduate courses, DU can start organising entrance test at pan India level, similar on the lines of other competitive exam being held in the country. An entrance examination for admissions to DU UG courses will give a fair chance to all students from across the nation. In view of different marking/grading system being followed by various state and CBSE boards, an entrance examination will address this issue. There was a buzz of DU conducting online entrance exam for nine undergraduate courses. Since these courses are not highly opted by students, the introduction of online tests might help in pulling a greater crowd for admission. Also, I think the introduction of the system into other courses will help in filtering the quality of crowd, especially keep a check on students who get admission through lenient marking in the state boards at times.